In eight years of producing screen capture feedback I have produced over 1200 videos for students. At the HEA Social Sciences conference in 2015 at The Studio Manchester it was great to see a number of presentations on screen capture feedback. Two uses of screen capture feedback stood out to me, one from Emma Mayhew, Reading University which involved Turnitin feedback with an additional video within video personal message from the lecture to the students, the other was from Philip Jones, Cardiff Metropolitan University providing feedback from a summative examination as either an exemplar model personalised for the student from their exam answer paper, or the scanning in via a data visualiser of the student’s examination answer paper; both with commentaries etc. For this conference I presented a talking poster, with a video screen that was able to show attendees real student feedback. 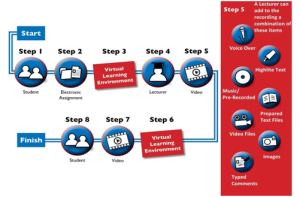 The video poster included interviews with both staff and students about creating and receiving screen capture feedback, (Figure 1). In the conference sessions I chaired a session and presented a fairly standard piece on the benefits of screen capture feedback, I presented it more as a conversation and a demonstration, I wanted to show how easy it is to create one of best forms of feedback possible. How it mimics the normal process of providing feedback. Even after 8 years and 1200 videos the response of students is still positive and the comments made are almost the same as in the first year. The third item was one of the ignite sessions of 20 slides in five minutes. This was a real challenge 20 slides in five minutes at your own personal pace is fine, but having 15 seconds on each slide come what may, and they moved on without any intervention from you is perplexing. This Ignite presentation was on the work of Philip Jones, another lecturer at Cardiff Metropolitan and his development of providing exemplar tailored model answers as feedback to student examination questions. Examination feedback is something that rarely happens for all students, it’s reserved for those who need to recover the exam, and this work showed feedback from examinations could be provided to all students, with a personalised version of their work overlaid onto the expected answer. The video was emailed to the student with the audio commentary, mouse movements, and other recordable materials, see figure 2. An alternative method of importation using a data visualizer was suggested to enable the exam papers to be captured. My history with screen capture feedback started in the academic year 2006/2007 when I started to produce student feedback via screen capture. Immediately I could see the benefits of this rich feedback potential and shared the idea with other staff. The student feedback file is a screen capture video, with audio commentary, mouse movements, anything that happens on screen is captured, and their production follows the flow in the diagram above (Figure 3). The student prepares their work in electronic form. The student work is uploaded to the VLE. The student receives an electronic submission receipt. The lecturer opens the student work, initiates the capture software, and starts recording the marking session. The lecturer can add verbal comments, demonstrate how the work should have appeared, highlight sections of text, add pictures, add handwritten comments, open and show other prepared files, and notes etc. When the marking session is finished the lecturer stops the recording. Upload to the VLE. The student downloads the video from the Virtual Learning Environment and can view it on Windows Media Player. “Some lecturers are happy to simply assign us a grade but with no information, which means that it is hard to tell exactly where we have gained/lost marks. Nigel on the other hand will provide a comprehensive set of comments explaining to us exactly where our marks come from. For our most recent assignment, he gave each of us a 10 minute video of him marking the assignment, which is extremely useful. This allowed us to look at the work through his eyes as opposed to as students“,Undergraduate student comments. “I can’t say I don’t understand so I lie and say yes I understand”. An undergraduate overseas student comment from research focus group (Jones et al., 2010). The reinforcement of understanding via an audio visual form rather than text was sometimes more accessible to the students. Control was expressed as actions that they could exercise with the written assessment feedback, “bin it”, “burn it”. The students also point out that physical assessment feedback can be lost; that their original work is often produced by electronic means and that using the VLE now they could place all the materials together in one electronic folder: the assignment description, resource materials for the solution, their draft versions, their final solution, and their assessment video feedback file. “The language is not my first language and maybe somebody says one time, two times and I’m sorry I don’t. I don’t want like to bother other people and say one time, two time, three times still not understand”…. “I think a video is more clear like step-by-step”.…“Obviously was my work on the screen with you going through and circling you know actually telling me you know this is wrong, you know you need to find another way to get this point across or another function or another bit of data, whereas if I was just looking at it in my work and then reading the comments it would be difficult for me to pick out does he mean this or does he mean that”. Undergraduate student comments from research focus group (2012). 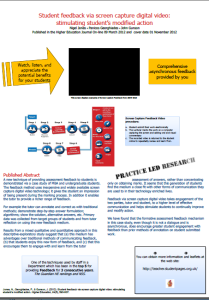 I turned this work into academic research after an internal grant was awarded and in July 2009 and I jointly submitted a paper to the Journal of Higher Education called “Student feedback via screen capture digital video: stimulating student’s modified action” (2012). The Higher Education Journal article was on line from March 2012 and published in the journal in November 2012. You may find in your LTDU department the CD package for Student Feedback via screen capture. In January 2013 I released the CD and provided a copy to every learning development teaching unit. 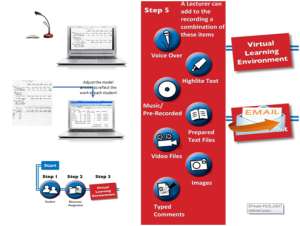 The CD provides you with software, tailor-able presentations, and exemplar videos of feedback types, a v-fold leaflet and posters to advertise your learning session presentation on screen capture video feedback. For more information go to my website http://teacher.studentpages.org.uk watch, read, and have a go at screen capture feedback. Inspire - teaching and learning in the Social Sciences by Nigel Jones is licensed under a Creative Commons Attribution 4.0 International License, except where otherwise noted.